Spotting a professional - Eric D. Brown, D.Sc. The word ‘professional’ is quite often overused in today’s world. There are tons of professionals out there. Professional sports players. Professional money managers. Professionals in the medical and legal industrys. Over the last 10 years, there’s been a move to make darn near every type of job a ‘professional’ type of job – “Professional” project managers (PMP), Professional HR managers (PHR / SPHR) and even developers / IT personnel have gotten in on the act with certifications like the Microsoft Certified Professional (MCP). Now…there’s nothing wrong with the above certificates at all. If you’ve earned a cert, be proud of it…but don’t expect to be immediately seen as a ‘professional’ just because you’ve got a piece of paper. Same goes for degrees too…go read a great piece by JK Allen that touches on this topic in a post titled Who Needs a MBA (or any Degree) When You Have Hustle? But…if a piece of paper / certificate doesn’t make you a professional…what does? Simple – an attitude. Yes…an attitude. Of course…don’t try to be a Doctor or Lawyer with just your attitude…you’d definitely need to have the requisite school/cert/paper there. But…for most everything else in life – attitude works wonders. My wife and I recently listed our house for sale. While getting the house ready for sale, we noticed a few issues that would need to be fixed. A couple of our windows had their seals broken and needed to be replaced and a few sprinklers needed to be fixed. We listed these issues on the Seller’s Disclosure listing and made note that they’d be fixed before selling. We called out a Window repair company, a Carpet Cleaning company, an AC and Heat company and a sprinkler repair company. I was really surprised to find that each and every person that came out to the house was a professional. Not necessarily because of a certificate or license – but because of their attitude. Their attitude was focused on service and professionalism. They all wanted to do the right thing for me…they also all went above and beyond. The window folks – JJ’s Window Services in Dallas – did a great job. Highly recommended. If their website was working, I’d include the link…will add it if their website starts working again. The Carpet guy – Infinity Carpet and Tile Cleaning – what an awesome job they did. The owner, Michael Adkins is a professional…..he spent way more time at our house cleaning our carpet than he really needed to. The AC & Heat Guy – Dwight from Dwight’s Heating and Air – is a consummate professional. I know that if I need any service for air conditioning or heating system repair or help, Dwight’s there for me. I’ve used him 4 or 5 times over he last 8 years…awesome service. The Sprinkler repair guy – Mac from American Irrigation and Landscape – is just as awesome as the others. Mac was a professional with a capital “P”. I want to take a second to highlight what Mac did for…he’s actually the reason for this post. Mac was supposed to be at the house between 5 and 6PM. He called at about 5:30 to tell me he was running late and would probably be about 45 minutes to an hour late. I wasn’t happy that he was going to be late – but at least he had the professionalism to call and tell me. After the tune-up, he dug (literally) into the sprinkler problems. I had one sprinkler head that had come loose and needed fixed along with a leak that had sprung from a capped sprinkler head under my patio. Rather than stand around and think about the problem, Mac got to digging. He fixed the first problem within about a minute and jumped over to problem #2. While Mac worked, he kept me in the loop on what he was doing and why. He explained why he was digging where he was digging. He explained why he was digging the way he was (because he wanted to save the top layer of soil and grass). He fixed both problems within about 15 minutes. He wasn’t slacking…he was digging and moving fast. For a man / company that was paid by the hour, he was moving a lot faster than I expected him to. In addition to solving my immediate problems, Mac gave me some hints on ways to not have these problems again. He told me where to go buy my sprinkler heads and supplies (local irrigation supply store…don’t but them from Home Depot). He also gave me some hints on keeping the grass watered while not wasting water. Overall, Mac was a great guy. He solved my problems and he educated me. He also made me a customer for life. You see…it wasn’t the fact that Mac had a license from the state of Texas that made him a professional. What made him a pro was the fact that he had the right attitude. He approached service the right way. Sure…he was late….but he let me know he was going to be late before he was late. The key to Mac’s professionalism – his attitude. He was focused on doing the job and doing it right. He was focused on providing the best service he could provide too. So..for everyone out there who’s relying on a certificate, degree or some other form of validation of your professionalism – you’ve gone down the wrong path. 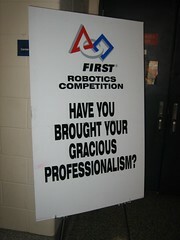 Professionalism isn’t found in a certificate or piece of paper. Its found in your heart and in your mind. Its your attitude toward your job, life and the world. Get the right attitude + some ‘hustle‘ and you’ll have it made. [You need to see this] Spotting a Professional http://t.co/2xbieQX good learning from @ericdbrown 's experience. RT @elliotross: Nice Eric RT @EricDBrown: Published: Spotting a professional http://ericb.co/qVotr4 <– Thanks!